The Tannehill Tramway Trail is a crushed stone walking trail that follows a section of an old mule-drawn tramline from the historic Tannehill Ironworks and nearby brown iron ore beds inside Tannehill Ironworks Historical State Park near McCalla, in central Alabama. Tannehill is located off Interstate 59, 12 miles southwest of Bessemer, less than 30 minutes from downtown Birmingham. Take I-59/20 to Exit 100 and follow the signs (approximately 2 miles) or take I-459 to Exit 1 and follow the signs (approximately 7 miles). Nature has blessed Tannehill. The beautiful tree-lined valley, hillsides rich in ore and swiftly flowing Roupes Creek made this a perfect setting for a successful iron making operation, as the early settlers realized. The same ingredients afford today's visitors a pleasurable escape from modern life. Tannehill Ironworks Historical State Park has more than 1,500 acres in three counties set aside for hiking, camping and outdoor recreation. A miniature railroad chugs through the pines. From spring through fall, the blacksmith, miller and craftsmen demonstrate their trades. Craft shops occupy restored pioneer cabins and artisans chat with visitors from their front porches. Steeped in history, Tannehill feels timeless. The cotton gin, pioneer farm and working gristmill preserve a long-gone way of life. 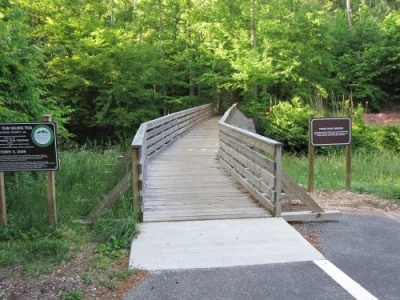 Hiking trails retrace historic roadways. Artifacts of Alabama's 19th century iron industry displayed in the Iron and Steel Museum put in perspective the massive stone furnaces, Tannehill's awe-inspiring centerpiece. Events include a Dulcimer festival, Gem and Mineral show, Woodcarvers show, Educational programs for school children, a Labor Day Celebration, Halloween Festival, and Christmas candlelight tour. Daniel Hillman, a Pennsylvania furnaceman, first built a bloomery forge on the banks of Roupes Creek in 1830, where he had found the richest deposits of brown iron ore in his experience. He wrote his son: “I believe, George, that my prospects for making a handsome property are better than they ever were…” Hillman died two years later, the family's fortune unmade. Ninian Tannehill later took up the forge as a sideline to his farming operation. Between 1859 and 1863, slaves cut sandstone rocks, transported them by skids and stacked them to form three tall furnaces. Tannehill No. 1 was built by the noted Southern ironmaster Moses Stroup, who later built the Oxmoor Furnace, the first in Jefferson County. William L. Sanders purchased the operation in 1862 and set about expanding the ironworks. Like the wheels and gears of a huge machine, the industrial center at Tannehill kept up a fierce momentum. Trees on the hillsides were felled to be made into charcoal that fed the huge blast furnaces. Roupes Creek and a mighty steam engine powered the blowing machines to heat the fires that melted ore to be formed into “pigs” of iron which, in turn, formed the tools of war for the Confederacy. At the height of production, Tannehill could turn out 22 tons of iron a day. The iron was cast into ordnance, skillets, pots and ovens for the Southern army. On March 31, 1865, it ended in fire and destruction. Three companies of the Eighth Iowa Cavalry swept through the area as a part of Union General James H. Wilson's raid on Alabama war industry sites. Smoke rose from the charred remains of the ironworks and cabins that housed several workers. At day's end, the furnaces were no longer operational, and the foundry, tannery, gristmill, and tax-in-kind warehouse were in ruins. This 150 year-old trail is distinctive in that it follows the old tramline that ran between the Tannehill Ironworks and brown iron ore beds two miles distant. Ore cars were pulled over rails by mules. 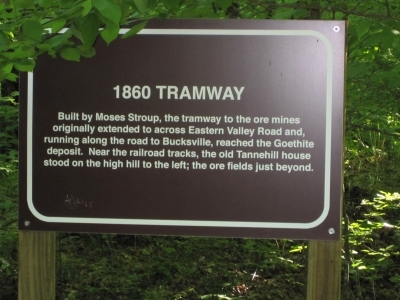 The tramway bed was later used to access the Tannehill area by local residents and the Lindsey Sawmill through the 1930's. 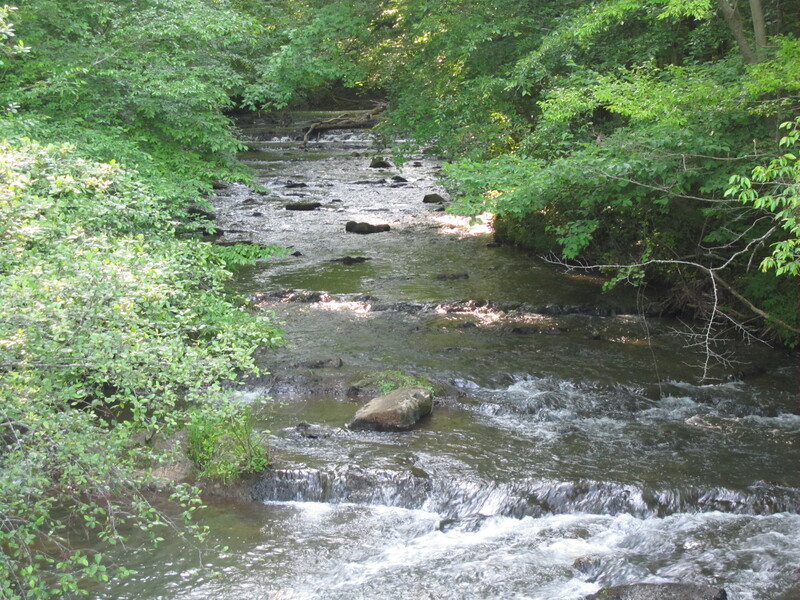 The trail takes the hiker past several historical sites that include the furnace and log cabins as it parallels lovely tree-lined Mud Creek. The Tramway Trail also connects to several other trails in the area, which a long-distance hiker would appreciate; it also is close to other activities within the park. Mountain bikers are also allowed to use the trail. View from Tannehill Tramway Trail.